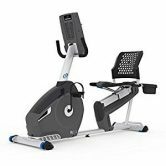 Recumbent exercise bikes are gaining noticeable fame in the last few years, and they are being widely used by fitness fanatics around the globe. 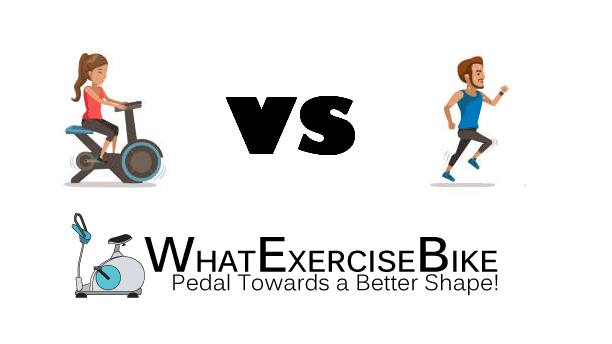 However, the biggest challenge which these people might face is keeping their upper body as toned as their lower body, while using a recumbent bike. 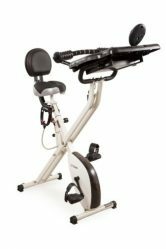 Here are a few effective exercises you can do while riding a recumbent exercise bike. Dumbbells are the best way to tone your upper body as well, while you are in the process of toning your lower body on a recumbent bike. You can carry out a number of different exercises you do at the gym, while you are riding the exercise bike. Shoulder presses can be done in order to tone your shoulders and your pecks. Dumbbell curls are a great way to build muscle on your biceps and your triceps, while you are toning your legs as well. Moreover, skull crusher is an exercise which must be done if you need your upper body toned. It affects almost every part of your upper body, and also allows you to gain muscle in an easy way. On top of everything else, shoulder raises can also be done, in order to tone your shoulders and increase your stability over the recumbent bike concurrently. There are a number of different accessories in the marketplace, which are being used in order to workout while you are also indulged in a different activity. These accessories allow you to complete your workout session, while you are multitasking, which keeps you fit all the time. One of these accessories are resistance bands. Now most people might think that while riding a recumbent bike, they may not be able to use their hands or arms at all. 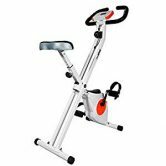 However, given the safety and stability recumbent bikes offer, users can easily use resistance bands so they can achieve lower body and upper body workout sessions at the same time. Resistance bands can certainly pressurize your muscles and make them stronger, while toning your body on the other hand. Moreover, they are great for forearms, shoulders and biceps, allowing these three few of the main body parts to tone effectively. If you want to keep a steady cadence on the bike, and along with your lower body, tone your upper body as well, medicine balls are one of the best ways to do that effectively. These balls are easily available at stores, and are also quite affordable for most of the exercise fanatics out there. What you can do is hold these medicine balls over your head and then bring them down after every 30 second increment. This exercise can be repeated throughout the session. Another engaging exercise is holding this ball horizontally against your chest, and then twisting your torso while staying steady on the recumbent bike. 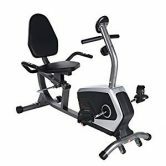 Apart from using these equipment for your upper body workout while you are on the recumbent bike, you can also workout without any equipment. Abdominal squeezes is one of the most effective techniques to achieve this. You need to brace your abs like someone is going to punch you for about 30 seconds, and then rest for the next 30 seconds. This can affect your lower abdominal muscles exceptionally, toning them along with your lower body. Moreover, you can also carry out arm circles while you are riding the bike. This exercise is especially great for your shoulder training, and allows you to flex easily while working out. On top of that, you can turn arm circles into high-intensity workout by holding a pair of dumbbells and then performing this exercise. 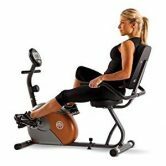 If you are toning your lower body while working out with a recumbent bike, do not forget to pay the same attention to your upper body. Hence, make sure to try some of the exercises mentioned above; to achieve a well-toned lower and upper body.